Anniversary Addition! Just The Van For The Coming Seasons. Great For The Family. One-Owner, Clean CARFAX. Navigation, Power Sunroof, Heated Seats, Heated Steering Wheel, Remote Start, Rear Back-up Camera, 7 Passenger, Leather Interior, Bluetooth Hands Free, Blind Spot Monitoring, Rear Seat Entertainment, Cross Path Detection, ParkSense Rear Park Assist System, 3.6L 6-Cylinder SMPI DOHC, 40GB Hard Drive w/28GB Available, 6.5" Touch Screen Display, Anniversary Edition, Anniversary Edition Floor Mats, Anniversary Edition Splash Screen, Audio Jack Input for Mobile Devices, Bright Door Handles, Driver Convenience Group, Dual Rear Overhead Mini Consoles, Garmin Navigation System, Heated Front Seats, Heated Second Row Seats, Heated Steering Wheel, Keyless Enter-N-Go, Mini Overhead Console, Overhead Ambient Surround Lighting, Overhead Storage Bins, ParkView Rear Back-Up Camera, Power Sunroof, Quick Order Package 29V Anniversary Edition, Radio: 430N, Remote Proximity Keyless Entry, SiriusXM Travel Link. 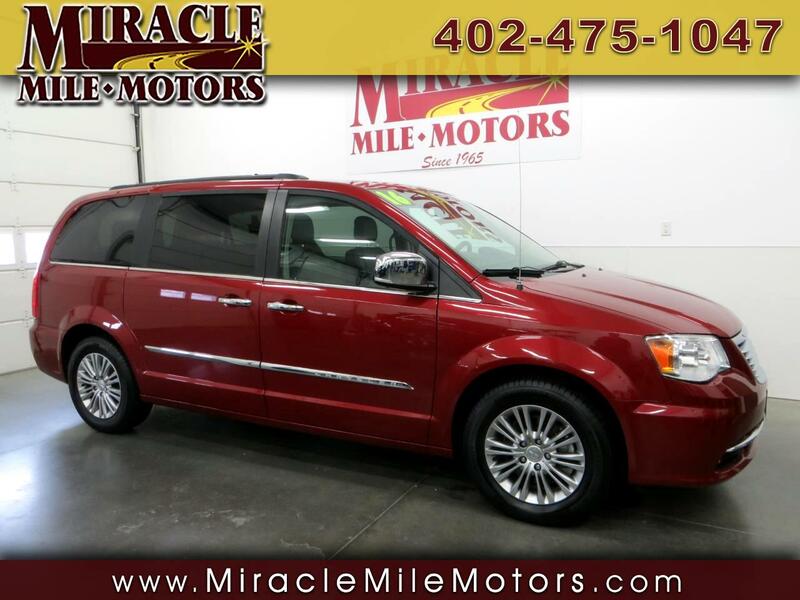 2016 Chrysler Town & Country Touring-L 4D Passenger Van 6-Speed Automatic FWD 3.6L 6-Cylinder SMPI DOHC Miracle Mile Motors in Lincoln NE have been in business for over 50 years selling premium quality used cars, trucks and SUV's vehicles. We are committed to save you time and money and make your buying experience hassle free and pleasurable. All of our prices are clearly displayed on each vehicle. We offer bank financing , service contracts, and Carfax reports. NO DOCUMENTATION OR HIDDENS FEES. Word of mouth is our best advertising. Please look thru our inventory at www.miraclemilemotors.com or e-mail with any questions. 1-888-465-8963 87th & Hwy 2 Lincoln, NE 68526 Where Friends Tell their Friends to Buy CarS.